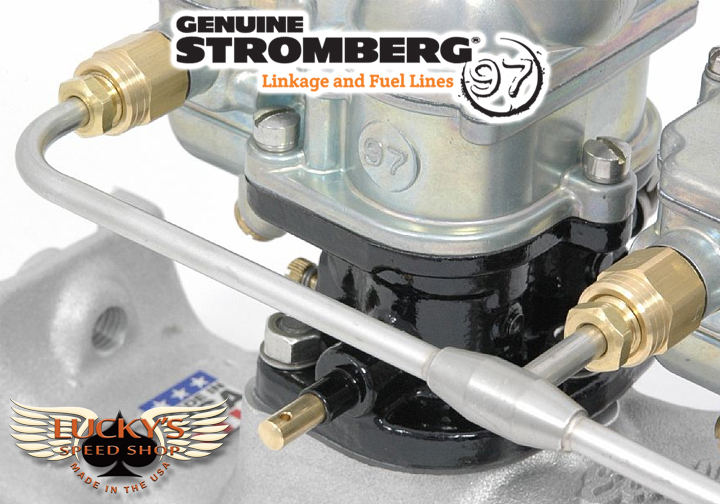 Stainless steel fuel line for use on Edelbrock 1108 (1933-48 Ford Flathead) 3×2 intake with 59A ‘glass bowl’ type fuel pump. 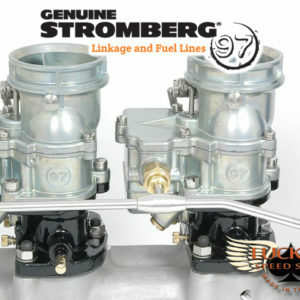 Designed and manufactured exclusively by Stromberg Carburetor, TwoStep Fuel Lines combine super-clean looks with hot rod styling and simple installation. Each kit is supplied ready to install in just two simple steps. TwoStep kits are not a ‘one size fits all’ solution. They’re CAD engineered to fit Stromberg 97, 81 and 48 carburetors on specific intake manifolds with specific fuel pumps (or a remote pump), so please check you’re ordering the right kit. Carburetor spacing differs between intake makes and models and fuel pump mounts vary. 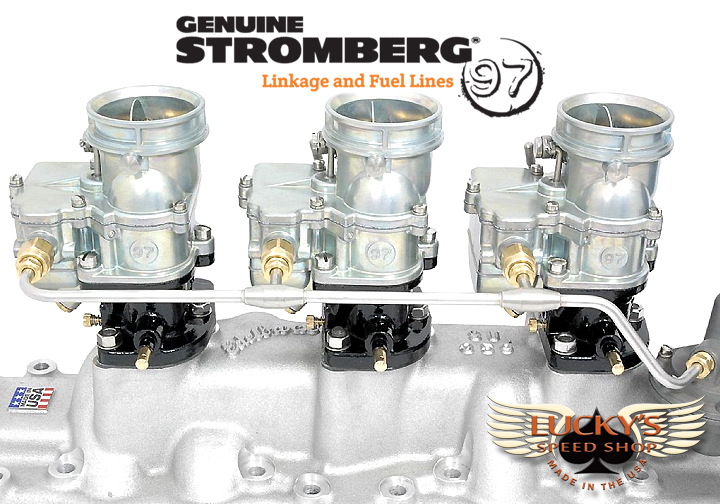 This fuel line fits three carburetors on the Edelbrock 1108 3×2 intake (for 1933-48 Ford Flathead engines) with the stock Ford-type 59A-9350 fuel pump – the ‘glass bowl’ shape pump – available new from your favourite Early Ford parts Shop. Try our dealers first!. 1/4inch OD lines, CAD-designed and CNC-bent for an exact fit. Invisible furnace brazed joints for OE looks and fuel-tight quality. 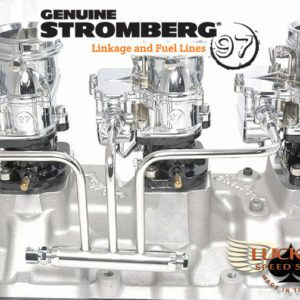 Every Stromberg TwoStep Fuel Line kit comes with full instructions, and further help with selection, installation and tuning is available at our Tech Center. Please note: The TwoStep fuel line is simple to fit, but on some intake manifolds, you may need to rotate the top of the fuel pump to get the optimum line from carbs to pump outlet. This is a typical Hot Rod trick and very easy to do. Simply remove the small screws around the top of the pump, keeping downward pressure on the top before releasing the spring gently. Rotate the top casting (usually by one screw space) and replace the screws tight. One more thing. 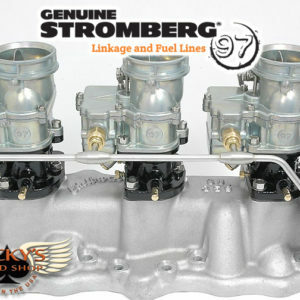 Unlike some aftermarket needle & seat inlet fittings, Genuine Stromberg S-jets ensure that the fuel line fits the same depth into each carburetor, which is vital for good fuel line alignment. 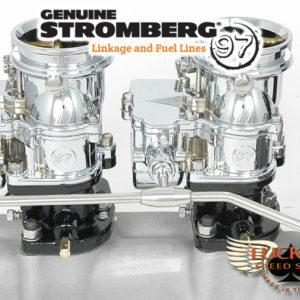 All new Genuine Stromberg 97 carburetors are S-jet equipped.